Here’s how to make your Monday better–celebrate National Brownie Day! Here are three suggestions from our archives. First, everyone deserves a good brownie – even those who are gluten-intolerant or gluten-free by choice. Our vote goes to1-2-3 Gluten-Free Brownies. Kimberlee Ullner developed this and other delicious mixes after she and her family members were diagnosed with celiac disease. The mix is affordable compared to many other gluten-free brands and the brownies are quick, easy, and delicious. 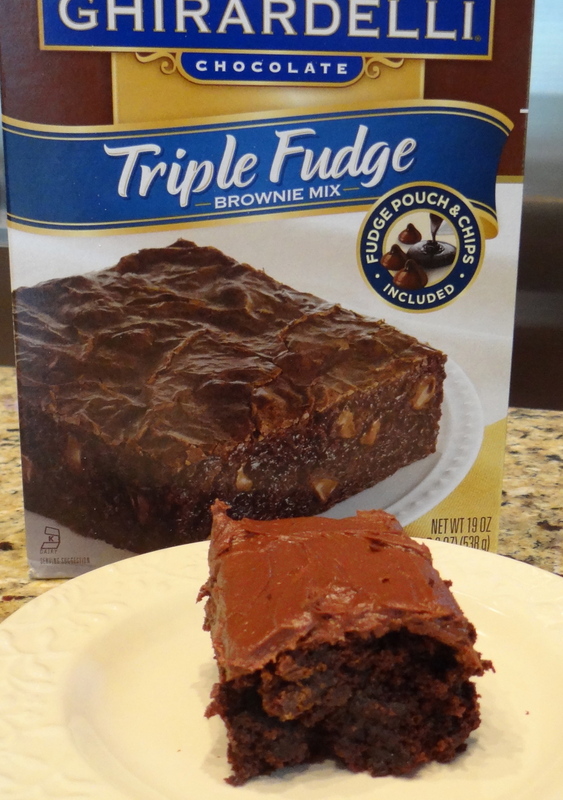 Ghirardelli Triple Fudge Brownie Mix is an always reliable pantry staple. If this isn’t my favorite brownie, it is certainly in the Top 5. Top your brownies with some chocolate orange buttercream frosting and perfection ensues. Finally, if you aren’t sharing brownies with the kids, try these adult treats we baked up with another great Ghirardelli brownie mix, Kahlúa, and espresso powder. Even though the alcohol evaporates during baking, sugar and espresso are just not a good combo for the kiddos. Just saying.